Eli Tomac pulled off his first win of the year in what were atrocious conditions at Petco Park in San Diego, California, February 2, for round six of the Monster Energy AMA Supercross Championship. Heavy rain leading up to the evening program left the San Diego track a miserable mess of standing water and deep mud for the racers, and just completing a lap without falling or getting stuck was an accomplishment in itself. The track had deteriorated so badly into the night that Tomac’s best lap time in the main was approximately 23 seconds slower that it was in the one and only timed practice/qualifier. (The day’s program was heavily altered due to the rain.) And Tomac (Monster Energy Kawasaki) was the top qualifier. In the main event, however, it was Ken Roczen (Honda HRC) who grabbed the all-important holeshot and had put himself into prime position to nab his first supercross win in over two years, but he threw it away just a couple of turns into the race and handed the lead to Tomac, who knew just how important it was to get out in front and avoid the mayhem and flying mud behind him. With clear vision, Tomac took full advantage of the point position and quickly opened up a comfortable lead, which he needed late in the race when he got his footpeg hung up on a Tuff Block and then got held up behind a couple of fallen lappers. At one point, he had amassed a 13-plus second lead, which shrank to just 4.1 seconds at the checkers. Second place ended up going to Marvin Musquin (Red Bull KTM) who passed Roczen two straightaways before the finish line, taking full advantage of a bobble by the Honda rider to complete the pass for runner-up honors. Roczen was extremely disappointed with his third-place finish, knowing he let a possible win get away from him, and then adding insult to injury, giving way to Musquin just a few yards from the finish line. Fourth place, however, went to a very happy Justin Bogle (Rocky Mountain ATV/MC-KTM-WPS) who held down second place for much of the race after taking control of the position when Roczen went down on the first lap. Bogle rode well in the terrible conditions, but both Roczen and Musquin got him late in the race. Now former points leader Cooper Webb struggled in the mud. Rounding out the top five overall was the veteran Chad Reed (JGRMX/Yoshimura/Suzuki Factory Racing) who always seems to do exceptionally well in San Diego. Reed got off to a good start and rode steadily through out the time-shortened race. 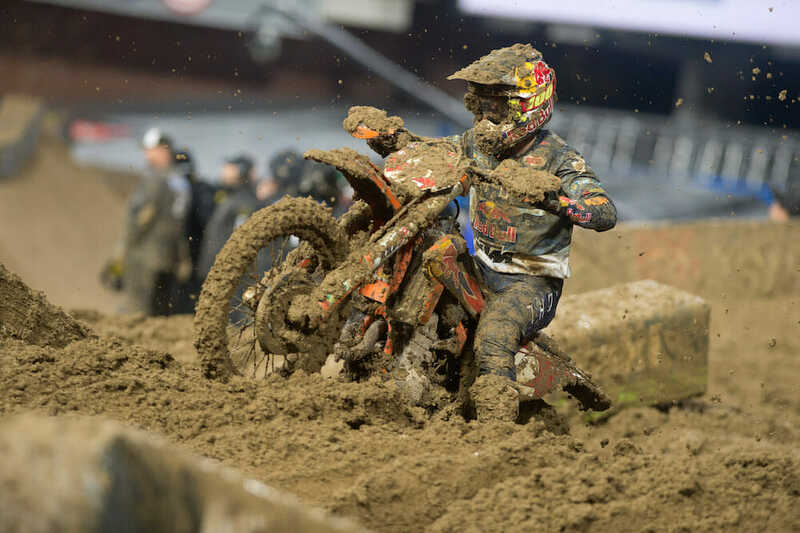 Due to the conditions, the 450SX main event was shortened from 20 minutes to 15 minutes. 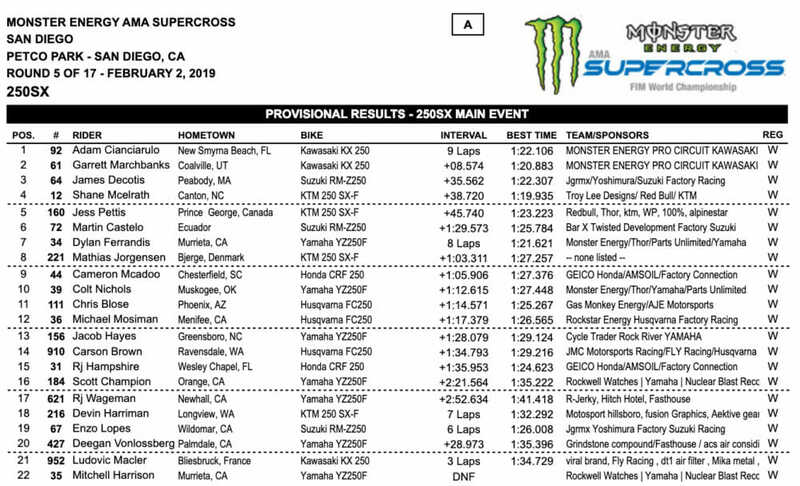 Aaron Plessinger (Monster Energy Yamaha), who is known for his mud-riding prowess, was sixth, followed by Joey Savatgy (Monster Energy Kawasaki) and Cooper Webb. Webb, the points leader going into the race and the winner of the last two rounds, had his problems in the mud after getting off to a decent start. But a couple of crashes, including one while chasing his teammate Musquin, kept him out of the top five. Arizona winner Blake Baggett (Rocky Mountain ATV/MC-KTM-WPS) started off in fifth but slipped back to 10th by the finish. A clutch problem ended Justin Barcia’s night way too early. Perhaps the most disappointed rider of all at the end of the night was Anaheim 1 winner Justin Barcia (Monster Energy Yamaha) who retreated back to the pits just a few laps into the race when his bike—caked with mud—called it an early night with a clutch issue and was forced to take a DNF. He pulled just two points for a day’s worth of work. Tomac is the new points leader, but it’s still tight at the top of the leaderboard. Just eight points separate the top four riders. Musquin and Roczen are tied for second, just four points behind Tomac, and Webb slips back to fourth, four points behind Musquin and Roczen. Barcia took a big hit in the championship. The one-time points leader is now seventh in the 450SX standings, 22 points behind Tomac. There were a couple of notable non-starters. Justin Hill (JGRMX/Yoshimura/Suzuki Factory Racing) went to the hospital with a chest injury after crashing in practice, and Justin Brayton (Smartop/Bullfrog Spas/Honda) pulled out of the evening show with a sore thumb that he also injured in practice. 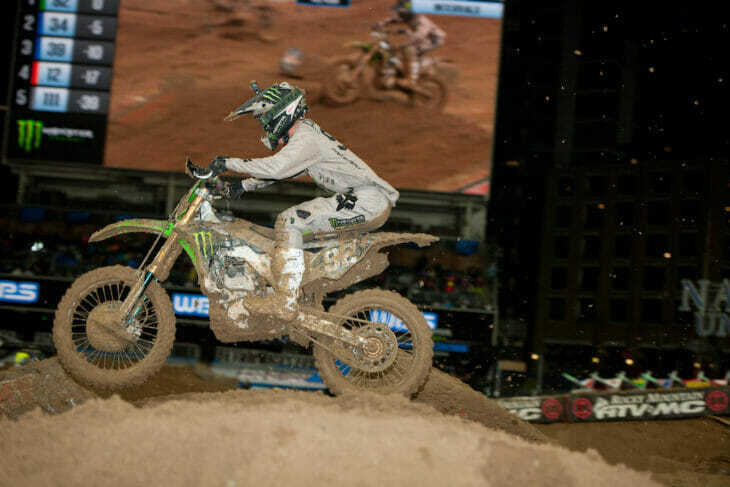 In the 250SX West main, Adam Cianciarulo was just about perfect in the mud. He led every lap of the time-shortened race (15 minutes to 10 minutes), using his long legs to an advantage in the muck. 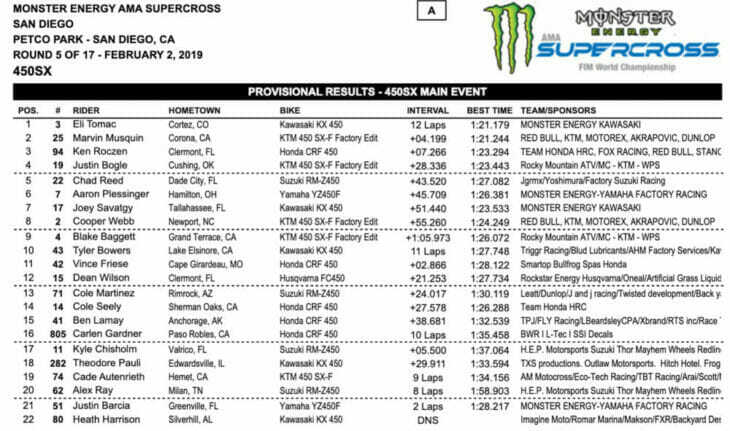 He barely put a knobby wrong as he rode off with the win, finishing almost nine seconds ahead of his teammate Garrett Marchbanks, making it a Monster Energy/Pro Circuit/Kawasaki 1-2. Adam Cianciarulo could do no wrong in the mud en route to the 250SX West main-event win. Marchbank, a supercross rookie, also looked good in the mud, putting passes on much-experienced riders en route to his first career podium. Third place went to James Decotis (JGRMX/Yoshimura/Suzuki) who started the first lap in sixth place. Shane McElrath (Troy Lee Designs/Red Bull KTM) had an amazing ride. He went down off the start and completed the first lap in 19th place, but after the nine-lap race, he was holding down the fourth-place position! Canada’s Jess Pettis (KTM) rounded out the top five overall. It was a tough night for the Monster Energy/Yamalube/Star Yamaha Team. Colt Nichols lost his grip on the red plate, which he had since Anaheim 1, as he struggled in the mud. He finished out the main in 10th place. Nichols’ teammate Dylan Ferrandis had a lock on third place (and was running as high as second when Marchbanks passed him) when a fried clutch left him stranded on the last lap. He never saw the checkered flag. The Frenchman, however, was awarded seventh place, having completed eight laps. Cianciarulo, the new points leader and red-plate holder, enjoys a small points lead over McElrath, 114-106. Nichols dropped back to third with 104, and Ferrandis is fourth with 102 points.